During austral summer (December–January–February or DJF), intense precipitation over central-eastern Brazil is modulated by the South American Monsoon System and the South Atlantic Convergence Zone (SACZ). Previous studies identified spatial variability in precipitation trends over this region, suggestive of a poleward shift of the SACZ in recent years. 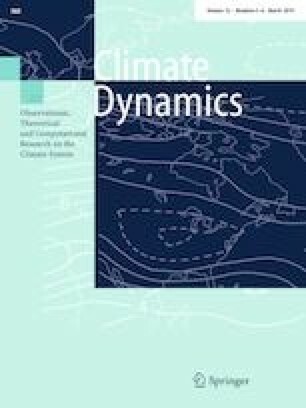 To identify underlying mechanisms associated with changes in the precipitation intensity and position of the SACZ, decadal averages of observed precipitation and the mean state of the atmosphere and ocean during three different periods from 1979 to 2014 are compared. Results show evidence of decreasing (increasing) average daily precipitation along the equatorward (poleward) margin of the climatological SACZ, likely related to a poleward shift of the convergence zone. Precipitation reduction along the equatorward margin of the SACZ is associated with weakening of the poleward winds along the eastern Brazilian coast and drying of low-to-mid troposphere (700 hPa) over the tropical Atlantic. These changes in circulation and moisture are likely related to the poleward expansion of the South Atlantic Subtropical High. The online version of this article ( https://doi.org/10.1007/s00382-018-4277-1) contains supplementary material, which is available to authorized users. GPCP Precipitation data was provided by the NOAA/OAR/ESRL PSD, Boulder, Colorado, USA, from their Web site at http://www.esrl.noaa.gov/psd/. NOAA High Resolution SST data was provided by the NOAA/OAR/ESRL PSD, Boulder, Colorado, USA, from their Web site at http://www.esrl.noaa.gov/psd/. M. Zilli acknowledges the Brazilian National Council for Scientific and Technological Development (CNPq) for the financial support through the Science without Borders Program (202691/2011-0). L. Carvalho acknowledges the São Paulo Research Foundation (FAPESP) Proc. 2008/58101-9. L. Carvalho and B. Lintner acknowledge the support of NSF-AGS-1505198.